Beginning in the September, 1946 issue of Ellery Queen’s Mystery Magazine, the cousins adapted several of their radio scripts to short story form, with the plan to collect them into a themed anthology. 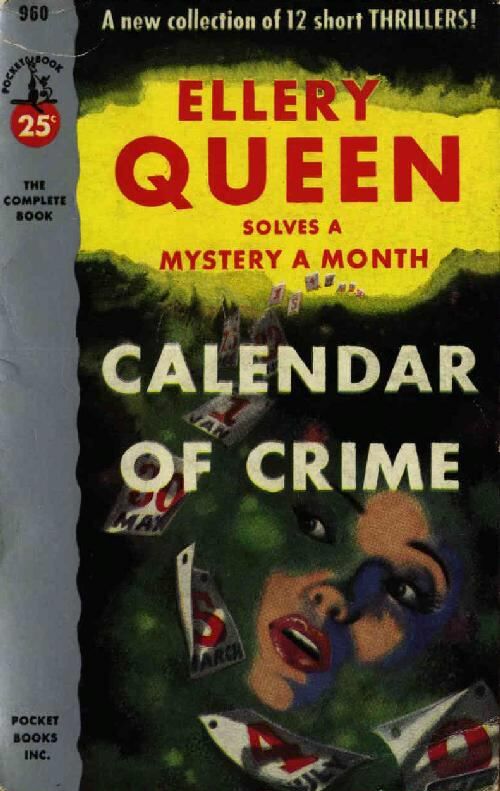 The collection, Calendar of Crime, was released in 1951, and contained twelve stories, each based in a different month of the year. These are not the best Ellery Queen short stories, by a long stretch. While the situations may be well-presented, the solutions are fairly silly. Take, for instance, the first one, “The Adventure of the Three R’s.” The three R’s, are, of course, the 18th century educational requirements for public schools: Reading, ‘Riting, and ‘Rithmetic. Ellery is called to a small college in Missouri to look into a disappearance. Turns out the whole thing is a publicity stunt: college professors feel they need to use Ellery’s fame in order to get people to read a new mystery story which has, of course, three clues, each related to either reading, writing, or arithmetic. The reading clue, to the trained eye, has an interesting tidbit: the missing person took a book out of the campus book shop just before he left on vacation. The book was Ellery Queen’s Origin of Evil, published in 1951. Since the story originally appeared in 1946, I wonder if the original text included The Murderer is a Fox, instead. Was the act of updating the title of that book a case of product placement in a story about, well, product promotion? Probably. So, the Three R’s show who Ellery was supposed to accuse. But, really, what mystery does not include some aspect of reading, writing and/or math? After I finish writing this, and you finish reading it, perhaps we can crunch the numbers. That should be *Queen’s Full.